Plug and play installation on 2014-2019 Harley-Davidson® Touring and Tri Glide™ models equipped with Air Wing Tour Pak® Luggage Rack (P/N 79179-08 or 53000063). Also fits 2014-2019 FLHTKSE and 2015-2016 FLTRUSE models with Original Equipment Tour Pak® Rack and 2014-2019 Harley-Davidson® Touring models with add-on OEM Tour Pak® and Air Wing Tour Pak® Luggage Rack. Custom Dynamics® Magic Strobes™ LTP2 Brake Light and Turn Signal Flasher can be purchased separately for 2014-2019 Harley-Davidson® Touring and Tri Glide™ models equipped with stock OEM Tour Pak® to add attention grabbing flash and strobe patterns when the brake is applied! The plug and play Magic Strobes™ adds 10 user selectable brake/flash strobe patterns to the OEM Tour Pak® LEDs and to the added Luggage Rack LED Light Bar. 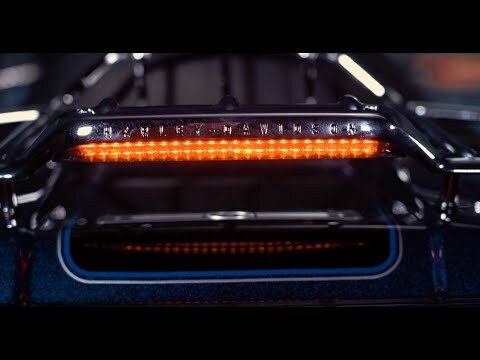 Additional Luggage Rack Dual Intensity LED Light Bar Fitments available for 1997-2013 Touring & TriGlide with OEM Tour Pak®, Freewheeler, or 1997-2013 H-D™ Models with add on Tour Pak®. 2014-2019 Harley-Davidson® Electra Glide Ultra Classic (FLHTCU), Electra Glide Ultra Classic Low (FLHTCUL), Road Glide Ultra (FLTRU), Ultra Limited (FLHTK), Ultra Limited Low (FLHTKL) and Tri Glide™ models equipped with Air Wing Tour Pak® Luggage Rack (P/N 79179-08 or 53000063). 2014-2019 FLHTKSE and 2015-2016 FLTRUSE models with Original Equipment Tour Pak® Rack. Add Custom Dynamics® Magic Strobes™ LTP2 Brake Light and Turn Signal Flasher to add attention grabbing flash and strobe patterns when the brake is applied! The plug and play Magic Strobes™ adds 10 user selectable brake/flash strobe patterns to the OEM Tour Pak LEDs and to the added Luggage Rack LED Light Bar. Fits: 2014-2019 Harley-Davidson® Electra Glide Ultra Classic (FLHTCU), Electra Glide Ultra Classic Low (FLHTCUL), Road Glide Ultra (FLTRU), Ultra Limited (FLHTK), Ultra Limited Low (FLHTKL) and Tri Glide™ models (including 2014-2019 FLHTKSE and 2015-2016 FLTRUSE).